Boost whole milk to give calves the balanced nutrition they need. Milk: It’s “nature’s most perfect food.” At least that’s what we’ve been told for as long as humans have been feeding calves. Whole milk is an excellent foundation for the liquid calf diet. But it often lacks the necessary vitamins, minerals and optimal fat-to-protein ratio that pre-weaned calves need to perform their best. Consider approaching the whole milk diet like you would for a lactating ration. Just like you work with your nutritionist to provide consistent nutrition with your TMR, you should also do the same for your calves. 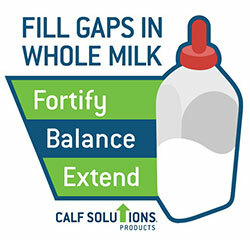 Fortify and balance whole milk to achieve a consistent calf ration, optimizing calf health and growth. Whole milk is deficient in most vitamins and minerals according to National Research Council (NRC) guidelines for pre-weaned calves. Fortifying the liquid ration with a vitamin and trace mineral pack can help ensure calves receive the same amount of essential nutrients every day. Milk fortifiers can also deliver a host of other beneficial agents to calves through their milk ration, including coccidiostats, ionophores, larvacides, yeast supplements and essential oils. Whole milk has about 12.5 percent solids. Waste milk, by its very nature, is much more variable – ranging from 5 to 14 percent solids on any given day. That’s not the kind of TMR-like consistency you want for your calves. To maintain consistency, you should test waste milk every time it changes so you keep tabs on its contents. A Brix refractometer is a simple on-farm tool you can use to test solids. The standard indicator for solids level is “Brix plus two.” For example, if the Brix reading is 8, that batch of waste milk contains approximately 10 percent solids. A powdered balancer can make up for solids shortfalls and help adjust the protein-to-fat ratio to ensure consistency in calf diets. Balancers are high in protein and can be used to re-elevate the protein level after water is added to drop, or dilute, the fat content in waste milk – much like high-performance milk replacers. A good guideline is to strive for a protein-to-fat rate of 1.4; for example, 26:20 or 28:20. Extender products, similar to a 20:20 milk replacer, can be mixed with waste milk and water to stretch your supply to meet daily feeding and calf nutrition needs. The correct amount of water is usually added to the milk powder to match the whole milk solids level or meet another solids goal. Whole milk is and will continue to be the foundation of a great calf nutrition program. As your calf performance goals increase, so must the level of nutrition you provide. To keep up with calf growth demands and shorter weaning times, include whole milk as a part of a complete liquid – not the sole source of nutrition. Learn more about how whole milk may be preventing your calves from meeting your growth goals at wholemilktruth.com.